India is ranked 3rd when it comes to internet users and the number of people coming online are rising with the rise of smart phone users. More and more people are shopping online as it is convenient, hassle free and with the wide array of options that one can avail. Thus, Online Shopping in India is doing great guns with enormous numbers.Companies such as Flipkart, Amazon, and Snapdeal have got huge investment and generated sales as compared to other shopping malls. These companies have become huge entities with their ability to deliver anything and everything that a shopper wants. Flipkart-Started originally as books site, this online shop now has a good collection of games and movies among with other items.Flipkart.com has now emerged as the renowned online shopping store in India. They offer cash on delivery on products of various amount. Moreover, now they have even started giving 30 day replacement guaranteeSpecifically, whenyou buy electronic items and other gadget there are chances that it might get some problems. Also, as Flipkart themselves acquires products in bulk directly from suppliers and ships items by its own self delivery personnel, for this reason there is a marked difference in the product price at Flipkart.com. Whereas sites such as ebay.in has different small-time sellers that sell their items. Amazon– Amazon is regarded as the one of biggest online retailer of the world due to its huge technology enabled online shopping and delivery system. Amazon India is headquartered in Bangalore and giving its competitors a hard time. Snapdeal-Snapdeal has been growing exponentially since it got converted into a marketplace. It is giving a tough competition to online shopping destination such as Flipkart and Amazon.If we look at the wide categories of product that snapdeal offers, the range is huge right from baby diapers, vehicle accessories, gold coins and jewelry. The prices are best and shipping is mostly free of cost. 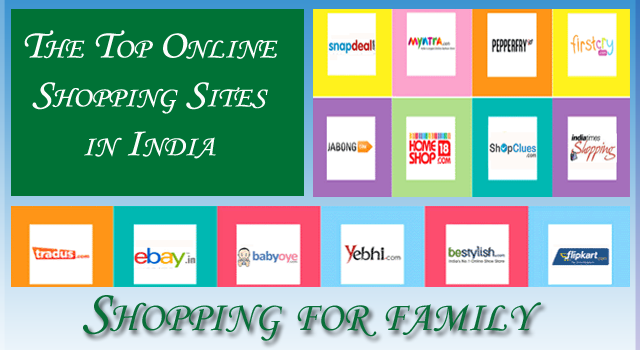 Ebay.in – When it comes to online shopping in India, Ebay is the best portal for shopping in India. It provides a large number of options for buyers in every category. The online store is known for selling electronics, laptops,jewellery, music CDs or fitness equipment the store has all. Being, the first major companies to enter the e-commerce market in India, this online storeis going great with mind-boggling sales figures. However, If you want to sell your own products even that is possible and it is really very easy compared to any other online shopping site.